When we were kids, my grandma used to make deep fried appams/ Kachayam with wheat flour and ripe bananas. It has been a long time since I had this. Recently I came across this recipe in Priya's Versatile Recipes and tried it. It was similar to my grandma's only that this is not deep fried and made in paniyaram/ aebleskiver pan. Everyone at home loved it, especially my kids. It is great for breakfast or just for snack. Other points to note about this is , no side dish is required for this and its completely vegan. It's a true Kids delight. Large ripe banana, 1 no. Powder the sugar and cardamom. Mix all the dry ingredients like wheat flour, rice flour, baking soda & salt and set them aside. Heat the jaggery with 1/4 cup water, when the jaggery completely dissolves remove from the stove and filter the syrup to remove the impurities, if any. Add this syrup to the flour mixture , add the mashed banana and powdered cardamom and mix well. If needed, add some water to get the desired consistency similar to idly batter/ pancake batter. Heat the paniyaram/ aebleskiver pan, add oil in each cup and pour the batter and cook in low flame and then turn the other side cook till its done. If the banana is large, one banana is enough, but if it is small add two. You can replace jaggery with sugar, if you desire. Never cook them in high flame, they will turn brown fast but inside the batter will still be uncooked. So cook in low flame. use a toothpick to insert in the middle to see if it's done. Wow they came out super prefect, thanks for trying Divya. Looks so perfect and irresistible one. Perfect paniyarams.. They look delicious. A very healthy snack Divya. 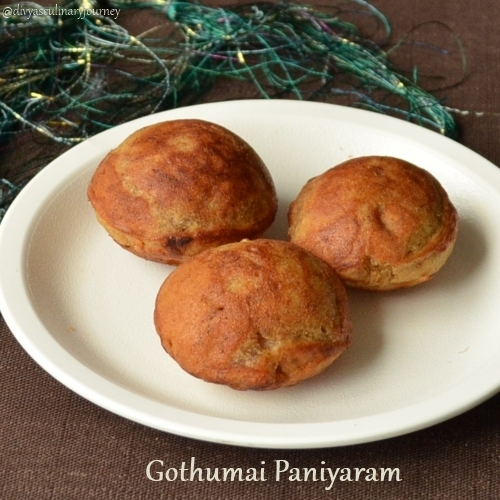 I love paniyarams...healthy instant version looks awesome. Perfect size and shape.. perfect for health too..
Oohh La La! Bring those to me, girl!